Welcome back, comic fans, to Stew’s Reviews! When last we reconvened, we discussed the merits 2005’s morally ambiguous (if a bit too rapey) mystery story from DC, Identity Crisis. 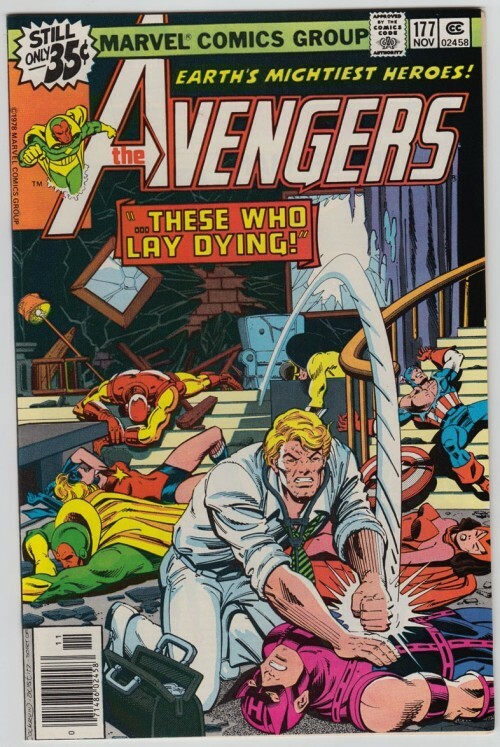 Today, we’re shifting over to the Marvel side of things and taking the Delorean back to 1978 to remember the time the Avengers were given the worst CPR ever. The Korvac Saga, which ran from Avengers (volume 1) #167-177, is considered one of the seminal arcs of the original run of The Avengers, and this will be the first time I’ve ever read it so I am thrilled to bring you all on this journey into a classic story with me! Written by Jim Shooter, with pencils and inks by George Perez and Pablo Marcos, this is a tale of The Avengers battling one of their most powerful foes: Michael Korvac, a man with nigh omnipotence. It features guest appearances by the Guardians of the Galaxy (not the ones modern readers are likely thinking of, but Marvel’s original team by that name), as they have come back in time in search of Korvac, The Mad Machine Man. The Guardians believe Korvac intends to disrupt the timeline by murdering Vance Astro, one of their members, as a child, thereby preventing him from ever forming the Guardians in the first place. For an arc generally referred to as “The Korvac Saga“, it is remarkable how much of it sees The Avengers not fight—or even come in contact with—Michael Korvac himself. The team doesn’t even meet him until issue #176, and their entire battle is waged and resolved in the following issue, the last of the arc (to be fair, issue #168 does see Starhawk, a member of the Guardians of the Galaxy, confront the villain only to get reduced to ashes and remade by Korvac). On the way to this central conflict, we get the introduction of Henry Peter Gyrich as The Avenger’s antagonistic liaison to the United States government, a two issue Ultron storyarc featuring Jocasta’s coming into The Avengers’ fold, a two issue battle against The Collector (which ends when this cosmic elder of the universe is, no joke, defeated by Hawkeye shooting him with an arrow), and two more issues of self-contained stories (#169 in particular is a complete non-sequitur of a story that doesn’t even have overarching subplots of the Korvac saga). This isn’t to say that these lead-up stories don’t belong here (aforementioned issue #169 notwithstanding), because they give a lot of development, clues, and backstory to the superhero team and the character of Korvac himself. The most important of which is the relationship Michael develops with a woman named Carina, a model he abducts from a fashion show in issue #168. Their relationship is… let’s just say odd. Actually, let’s also say underdeveloped. After abducting her, Michael inexplicably refers to her as his wife in the very next issue, and with no development between them whatsoever, we find out in issue #173 that Carina deeply loves Michael when he searches her mind for signs of betrayal but finds these feelings for him instead. When it is revealed that Carina is the daughter of The Collector—the cosmic elder planted his daughter at that fashion show for Korvac to take a shining to—she allows the man she loves to kill her father. It’s all very stunted; there is no growth between them. We never see any reason that Carina would fall in love with the man she was put on Earth to stop… she just does. And while that would be annoyingly unsatisfying in a bubble by itself, their love is integral to the end of storyline even though it never feels like it should be real. In comparison to that, the development over this arc of both Wonder Man and Captain America feels very real, and they both grow significantly to get where the climax of the story takes them. Wonder Man is still relatively newly back from the dead by the time this starts, and while he has been welcomed as an Avenger, he is letting fear rule his thoughts. Though he presents with a sense of bravado (he is fond of reminding everyone that he is nearly on Thor’s level) Simon Williams is a man who has seen death and is terrified to return to it. During the battle with Ultron, he is consumed by trepidation and hesitation, to the point of subconsciously letting himself drift to the back of the Avengers when they confront the evil robot despite the fact that he is one of the more invulnerable members. Captain America is also beaten down at this point, having proven himself a liability to the team more often than a boon, and Scarlet Witch viciously points this out in #168. These mental defeats have worn down Captain America to the point of turning him angry and bitter. We see early on in the series that he is brutally judgmental of Iron Man and his decisions as chairman of the team, to the point of childishly bickering with his teammate. Both of these character movements would come to a head in the final (only?) battle with Korvac. And what a battle it is! As Moondragon watches in horror, The Avengers and Michael Korvac wage a battle for the fate of the universe… and Korvac slaughters them, one-by-one! And even though Captain America has seen Avengers stronger than he go down, he still confronts the mad god and actually holds his own, if only for a few panels. But in the time, it’s classic Cap again, refusing to back down and determined to show what a regular man can do if he’s full of righteous purpose. Immediately upon Captain America’s death, it’s Wonder Man’s turn to complete his journey, as he pounces on Michael and completely looses himself of the shackles of fear. He is struck down again in this fight, but he was able to face it like a man. Ultimately Michael is done in as he looks to Carina while the remaining Avengers assail him and finds hesitation in her eyes. With that, he surrenders to death, which only invigorates Carina to call upon her own power cosmic to briefly take up his assault, but her broken heart causes her to force Thor to slay her. And that’s how a plot device love that never was never developed and felt completely forced and out-of-place defeated two of The Avengers’ toughest foes. It has some moments that I really enjoyed, but by-and-large this honestly just felt like nothing special. The ending is annoyingly melodramatic, there is a lot of fat that could be cut from the story (you could drop issues 169-172 almost entirely if not for the small builds they do for the Collector story that start in #173), and there never seems to be the sense of urgency that there should be for a battle with such massive implications. I can’t stress enough how putridly underdeveloped the Michael/Carina relationship is, and that truly robs the story of a lot of the weight it should have. And I get that this was a different era, but aspects of this dialogue by supposedly adult characters are just written so childishly and simplistic. I don’t want to hold that against a basic superhero story from the 70’s, but if you compare here to what Claremont was doing on X-Men during the same period, it’s not even close. It’s not consistently juvenile throughout the series, but it popped up enough that it was grating on me (particularly the early scenes of Cap and Iron Man harassing each other). I almost feel guilty about not liking this more, because I had looked forward to reading this for years what with how much I’d heard how fantastic the Cap/Korvac showdown is (and while it IS good, it doesn’t quite live up to its legacy). Read it for the highlights, but don’t go in expecting to be knocked off your feet. 4 out of 10? 4 out of 10?!? For one of Seminal stories of all Bronze age Avengers?!? I had a hard time choking down my bagel this morning when I read this. I smell a Andy’s Read Pile in the works to give an “alternative” assessment of this classic. Or better yet, who would like to see Stew and I debate this on a future podcast? Show of hands? ?